Yes, another Kitchen Sink Stamps card! This one used Beate Johns' Weekend Sketch #31 and the coolest cupcake stamp ever from the Happy Birthday Cupcake set. As you can see, I paper pieced it again. The one used both sides of one sheet of KI Memories paper. I also used two different stamps from Papertrey Ink's Rectangle Borders and Corners set. 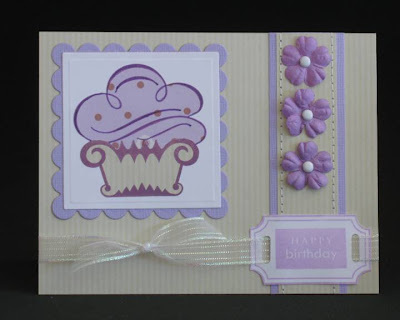 I used the darker Purple Hydrangea VersaMagic ink from Tsukineko for the cupcake so it would show up against the patterned paper, but then the lighter Spring Pansy ink for the rectangles because it coordinated with the color of the paper better. I will try to use some other stamps soon before you all think I'm secretly working for Kitchen Sink! I got a big shipment of Papertrey stamps this weekend and also have my gi-normous stockpile of Stampin' Up! stamps from when I was a demo. I'll also have a lot more ribbon projects as my May Arts order came today! 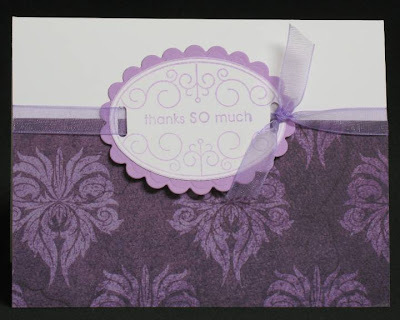 Other materials used: white cardstock and punch-Stampin' Up! ; purple CS-Bazzill; Prima flowers; brads and ribbon from unknown sources. I also went over the top of the cupcake with my purple Spica glitter pen, but you can't see it in the picture. I'm trying to work on how to photograph stuff like that. Today's card uses a genious idea by Leslie Miller, which is using a photo turn to keep a gate-fold card shut. I've always loved cards with interesting folds, but it bugged me that my gate cards wouldn't stay shut unless I tied some ribbon around them, which made it difficult for the recipient to re-close. So, thanks a bunch for the idea Leslie! You've probably noticed a trend of me using Kitchen Sink Stamps lately, and today's card will not deviate from that trend! I used another image from their "Thanks with Style" set that I adore because of my deep love for hearts and swirls. It took me a while to figure out which Nestabilities I wanted to use with the image. It didn't quite match any shape until I paired it with the new hearts set, and amazingly, it actually fits really well! A couple more notes about this card: I did some machine stitching along the edges of the grosgrain ribbon to make it look a little fancier and sponged the edges of the patterned paper (which is Loveland from Scenic Route that I *adore*), the plain heart and the sentiment which was punched using Stampin' Up! 's word window punch. 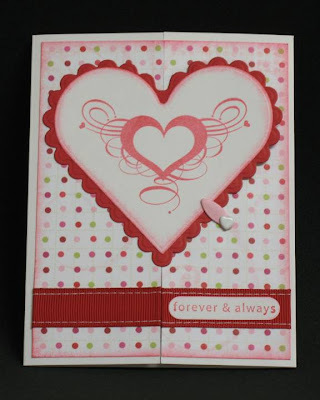 Other materials used: white cardstock from Wausau; red cardstock and grosgrain ribbon from Stampin' Up! ; red Brilliance ink from Tsukineko; photo turn and heart brad from unknown sources. Today's card is based on Amy Rysavy's Friday Sketch #3. As you can see, I turned the sketch on it's side because of the orientation of my focal image. At first when I picked the image from Kitchen Sink Stamps (the "Thanks with Style" set), I thought it might be too big for the sketch, but I think it worked out fine. I did some machine sewing, distressing, and as promised in my last post, I added a few extra bits of ribbon to the knot. I am so loving Amy's sketches and know I'll be using this one again! Keep a watch out for it! 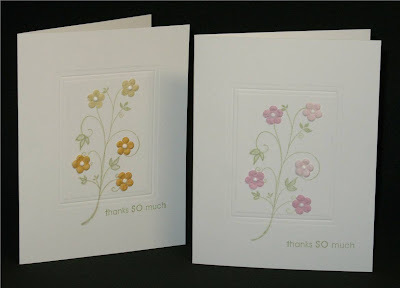 Other materials used: white cardstock for focal point from Wausau; white cardstock for card base from Stampin' Up! [and I can see that they are different whites so I will definitely not combine them again in the future]; ribbon also from SU! 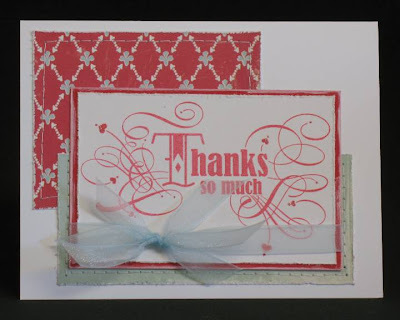 ; patterned paper from Cosmo Cricket; red Brilliance ink from Tsukineko. During my blog surfing this week, I stumbled upon a blog that I hadn't seen before, but that blew me away in an instant! It's Indigo Studio by Pam Bassett and it's *amazing*!! I was immediately inspired by her layering and sponging color on her layers, her use of such vibrant colors, all of her intricate cutting for paper tole effects, and probably most of all, her use of all that luscious ribbon! I was especially drawn to the layout of this card with it's multiple layers and ribbon tied between the focal image and sentiment. Although I said before that I really love Pam's use of lots of ribbon, I kept it really simple on this card because I knew I wanted to use this fatter Chatterbox ribbon from my stash and didn't think it would work quite right with a bunch of other ribbons. I'm planning on incorporating more ribbons into my projects in the future though (especially once my May Arts order arrives! ), and I'm definitely going to try Pam's ribbon blossom soon. I used what I call the coolest cupcake stamp ever from Kitchen Sink Stamps to do a little paper piecing. The top and bottom (as well as the back layer) are alternate sides from one piece of Scenic Route paper. You can't tell from the picture, but I traced over the lines on the top of the cupcake with my orange Spica glitter pen. I also did some accordian folding of the bottom to look a little like a real cupcake liner. Then I finished off with the sentiment, also from Kitchen Sink Stamps, and also gone over with the orange glitter pen. The photo corner was done similar to this one by Nichole Heady, except I used two sizes of Nestability squares instead of punches. The neat thing about using the Nestabilities is that the smaller square's edge embossed a line around the frame which gives the corner a little added texture. Lastly, I tied the ribbon on and added three Prima flowers with orange brad centers. Still a pretty simple card, but it's fancier than some of the really easy stuff I've been doing lately. Thanks a bunch to Pam Bassett for the inspiration! 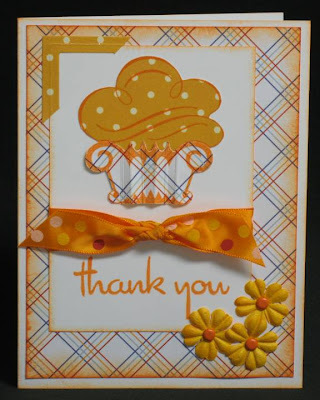 Other materials used: white cardstock and orange ink from Stampin' Up! As you can see, mine is a pretty close copy of her card in that I used the double-layered focal image with the ribbon going across the dividing line, and also the patterned paper bottom. 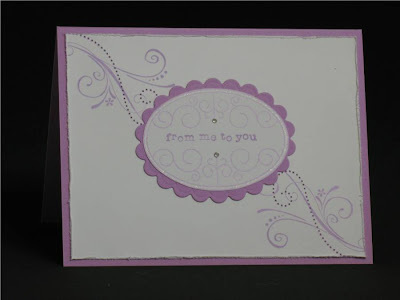 But for my take on it, I used the little slot punch from Stampin' Up! to run the ribbon behind the ovals and tied in a knot on the side. I really like the simplicity and versatility of the sketch and know I will use it again in the future! As with yesterday's ovals, I hand cut the stamped oval, but then used my Nestabilities for the scalloped oval. Other materials: oval stamp from Sweet Love set - Papertrey Ink; sentiment stamp, cardstock, and organdy ribbon - Stampin' Up! ; patterned paper - Imaginisce; spring pansy VersaMagic Ink - Tsukineko. Can you tell I'm still pretty excited about having started a blog? After doing my first "real" post, I decided to change the way I list materials. It's a lot more time consuming to re-list things already mentioned, so I'll only put unmentioned materials at the end. Here's something I said would be a rarity - an "original" creation. I put original in quotation marks because I know I've seen similar ideas before, but I really didn't have any specific creations in mind when making this card. You can't tell from the picture but the little dots above and below the sentiment are Swarovski crystals and I also used my clear Spica Glitter pen around the outline of the oval Papertrey stamp for a little more sparkle. I did a little paper piercing following the dots on the Stampin' Up! swirl stamp, and I distressed the edges with a distressing tool from Heidi Swapp. I really wanted to add some ribbon or flowers or other embellies, but couldn't figure out where, so I just left it as it is. Maybe I'll revisit this one later. BTW - I didn't cut the plain oval with my Nestabilities because this stamp doesn't exactly fit the Nestabilities shape. However, it was really easy to cut out by hand following the outside line of the stamp. I did mat with the Nestabilites oval scallop though, and even though it doesn't match exactly, it's close enough not to matter. Other materials used (still from memory because I stamped this before I started my blog): sentiment stamp and cardstock- Stampin' Up! ; purple ink - Tsukineko VersaFine ink. I was inspired by her use of a swirl stamp as a stem and adding little Prima flowers to it. I also LOVED the idea of using puffy paint dots as centers! I have to admit that I was really regretting buying all those teeny Primas because I could never figure out what to use for centers. I mean really - who want to use a ton of those things if you have to put a brad or button in the center of every single one?! I thought the puffy paint idea was just plain genious!! Thanks Leslie! Now here are my versions (mine are super simple): These first two, I used the entire stamp and the stem extended beyond the edge of the embossed rectangle. Then I tried masking the rectangle so the stem wouldn't extend beyond the edge. I think I prefer this version better (although the sentiment didn't stamp quite right). I also added her ribbon look by cutting a couple slits so I could give the illusion that the ribbon was going under the rectangle. Materials used (off the top of my head - I promise I'll try to write things down in the future): Foliage stamp - Fancy Pants; sentiments & organdy ribbon- Stampin' Up! ; flowers - Prima; green ink - Tsukineko Brilliance Ink; Nestabilites rectangle by Spellbinders. So I've finally started my very own blog. You may be able to tell from the title what it's about, especially if you're a stamper and/or scrapper. C.A.S.E. stands for Copy And Steal Everything, except that I will not be stealing, at least I hope I won't! Whenever I use someone else's idea, I will try my very best to give credit where it's due. So I guess my title could stand for Copy And Stamp/Scrap Everything. If you ever see anything not credited where it should be, please LMK and I'll fix it ASAP! The reason why I'm so focused on CASE-ing is because I'm VERY influenced and inspired by other people's work so that's where most of my creations come from. By posting my works, I get to share what I love doing and hope that I give others like me ideas about how to take influences and alter them to be their own. There will be the occassional post with my original creations or possibly stuff about my life, but I think most of my posts will be CASE studies. Hope you enjoy!